Yesterday and today, I have been dyeing wool. I'm very pleased with all the colors! I've dyed over five pounds of wool with my new acid dyes from Greener Shades and am very, very happy with the results. With a baby girl to care for, I sought out a new kind of dye that would be friendlier to use at home as well as better for the environment. I've used many kinds of dyes over the past several years, and I must say that Greener Shades does as well if not better than all the other professional acid dyes that I've used. 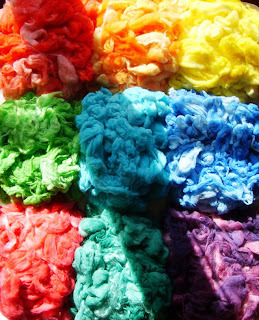 It is eco-friendly, non-hazardous, heavy metal free and can do impressively well at dyeing on top of all that. 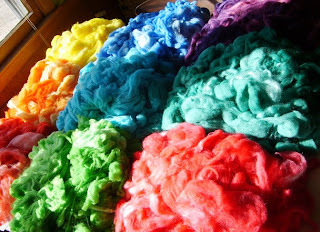 I think that I might have found a new professional acid dye to use long-term on my wool and silk. Copyright © 2010 Shalana Frisby. All rights reserved. May not be reproduced in any form without permission. They look Gorgeous! I wish I could afford a new craft. Beautiful! I just got three books on using natural dyes and collected my first bag of eucalyptus leaves. The colours will be much more muted than yours, but I'm looking forward to giving it a go. The colors look great! I am getting ready to order some of them! Can't wait till they get here! yummy fiber....hey...I'm thinking about a carder too...I'm going to look at them at the Maryland Sheep and Wool show 1st weekend in May...they are kinda pricey though...but gotta look, test out and hopefully have some moola saved for it. amazing color! I can't wait to try!! Thanks all! I appreciate the kind words about my little dyeing project. Frugal Kiwi, I'd love to see what kind of colors you get with the natural dyeing. I've always been a bit intimidated by the more involved process of it. Elise, drum carders are pricey! I have been wanting one for a couple of years now. I can finally justify it since it will be a great addition to my fiber business. It is to the point that I need one of my own.